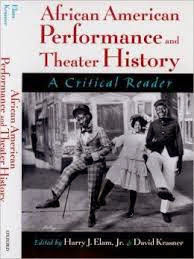 African American Performance and Theater History is an anthology of critical writings that explores the intersections of race, theater, and performance in America. Assembled by two esteemed scholars in black theater, Harry J. Elam, Jr. and David Krasner, and composed of essays from acknowledged authorities in the field, this anthology is organized into four sections representative of the ways black theater, drama, and performance interact and enact continual social, cultural, and political dialogues. Ranging from a discussion of dramatic performances of Uncle Tom's Cabin to the Black Art Movement of the 1960s and early 1970s, articles gathered in the first section, "Social Protest and the Politics of Representation," discuss the ways in which African American theater and performance have operated as social weapons and tools of protest. The second section of the volume, "Cultural Traditions, Cultural Memory and Performance," features, among other essays, Joseph Roach's chronicle of the slave performances at Congo Square in New Orleans and Henry Louis Gates, Jr.'s critique of August Wilson's cultural polemics. "Intersections of Race and Gender," the third section, includes analyses of the intersections of race and gender on the minstrel stage, the plight of black female choreographers at the inception of Modern Dance, and contemporary representations of black homosexuality by PomoAfro Homo. Using theories of performance and performativity, articles in the fourth section, "African American Performativity and the Performance of Race," probe into the ways blackness and racial identity have been constructed in and through performance.